See Offence - Kentucky ballscreens. 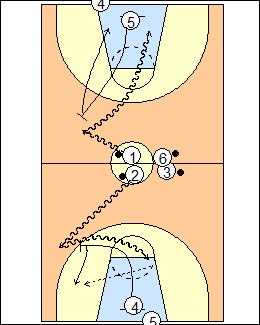 2-on-0 ballscreens at both ends, screeners start under the baskets, ballhandlers start at halfcourt and call "fist" (screen and roll to the rim by a 5-man) or "drag" (a screen set by a 4-man, roll to the rim or short roll). Ballscreens can be on a wing or high-angle. 1 dribbles to a high angle and is facing the basket, screener 5 comes up right at him, not sideways, the screen can be flat or angled either way. When 5 hops to set the screen, 1 skips on the dribble (to avoid getting a foul on 5). A pocket pass to the screener is a bang-bang play, not two dribbles then pass. A ballscreen on the wing is elbow high, shown for 2, 4 comes up through the nail.